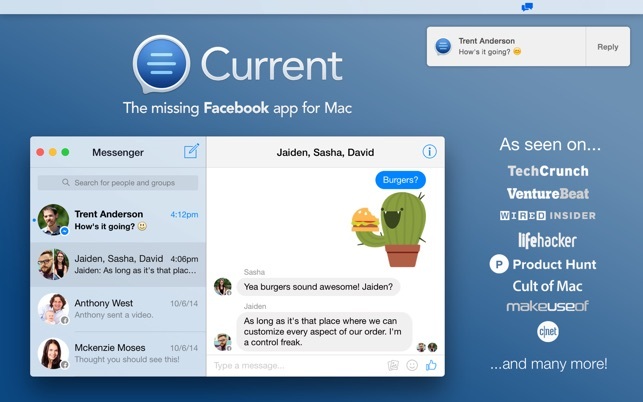 Current is THE BEST app for using Facebook Messenger and keeping current (pun intended) with Facebook on your Mac! Current isn’t just a messaging app. 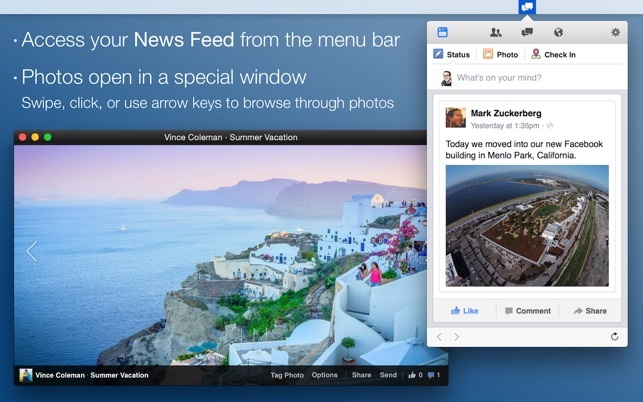 It’s a complete replacement for using Facebook in the browser, and it’s built to give you the best possible experience on the Mac. Current allows you to use only the parts of Facebook that you want and doesn’t include any annoying cross-promotional ads. 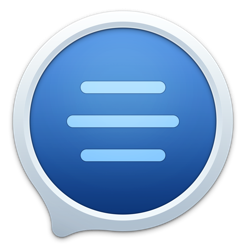 • Group chats, stickers, and everything else you'd expect with Facebook Messenger are all supported on Current. 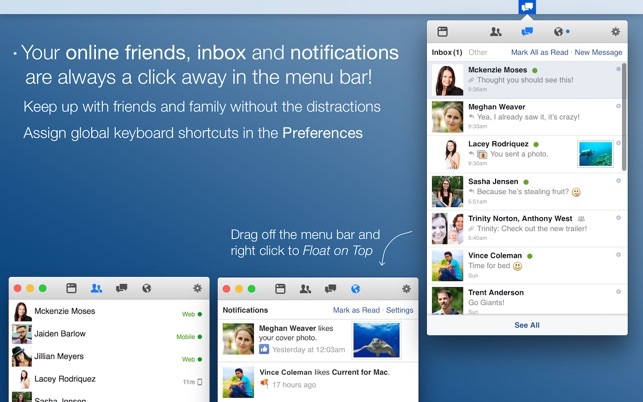 • Notifications are customizable in the Preferences so you can prevent unwanted distractions. • Photos open in their own windows where you can swipe through them to browse the album, as well as comment, like, share, tag, and go full screen. 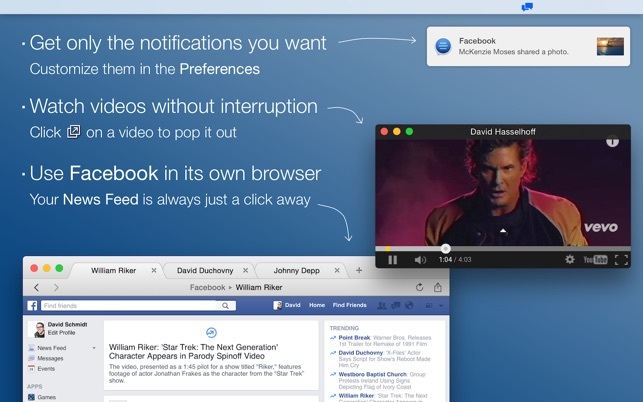 • Videos can be popped out of the page, so you can continue watching while browsing the newsfeed or using other apps. PLEASE SHARE AND SEND US YOUR FEEDBACK! If you enjoy using Current, please take a minute to share it with your friends. You can quickly do that from the Help menu. Thank you!!! • Current is a 3rd party application for Facebook and is in no way endorsed by or affiliated with Facebook Inc.
• Facebook and the Facebook Logo are trademarks of Facebook Inc.
• Add support for macOS Sierra! • Lots of other bug fixes! There is no help menu for this app, there is no way to contact developers or customer service of any kind. I have an issue where I click on a message and it pulls up some random person that I’m not facebook freinds with at all. It pulls up the same person no matter whose message I am trying to use. This has been going on for weeks. I sent feedback via the email they provide on their website and never heard from anyone. I’m thoroughly disappointed. It worked well for the first few months, but now it’s broken and I can’t get any help. I uninstalled this from my machine and will never use it again. Best way I’ve seen to use Facebook on my desktop. Fast, smooth, looks great, easy access to everything from menu bar. And it keeps Facebook cookies off my web broswer so I don’t get tracked across the web, too. 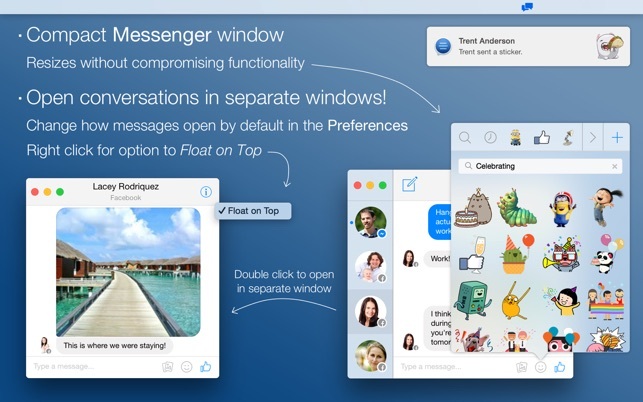 Great implementation of Messenger, though I don’t really use Messenger. FANTASTIC granular, separate control of notifications (menubar alert, dock icon, notifications center) for messages, notifications, and friend requests. I bought this app several months ago. Was great at the beginning. Until all the sudden a big bug happened with the private messages. Impossible to answer any of them anymore : a window opens and displays the name of Bill Lauman whom I don’t know at all.I reinstalled the app but no change, still buggy. I sent several messages to the customer service to ask for help but they have never answered. That is probbaly the most disappointing and frustrating : no consideration for customers.